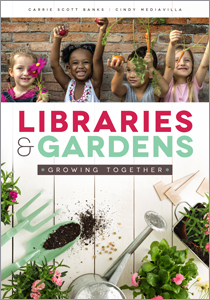 This manual will prove valuable not only to children's services librarians, outreach librarians, and library administrators, but also early intervention and family support professionals, early childhood and special educators, childcare workers, daycare and after school program providers, and policymakers. Carrie Scott Banks has worked with and on behalf of children with disabilities since high school. Taking over Brooklyn Public Library’s Inclusive Services in 1997, she created their gardening program in 1999. Ms. Banks taught inclusion at Pratt Institute from 2013 to 2015 and conducts inclusion trainings across the United States and Canada. She has had many roles in ALA: ASGCLA (Association of Specialized, Government and Cooperative Library Agencies) board member, committee member and chair, program organizer, and co-drafter of resources and tools for serving people with disabilities. 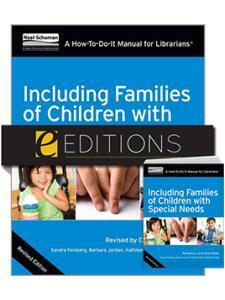 Her substantially revised edition of Including Families of Children with Special Needs: A How-To-Do-It Manual for Librarians was published in 2014. Sandra Feinberg has devoted the past 40 years to public library service and, since 1991, has served as the director of the Middle Country Public Library, the largest and busiest public library on Long Island (NY). An advocate for improving the quality of life for families, she firmly believes in the ability of public libraries to be family- and community- centered institutions. Under her leadership, what began as a local library program for babies, toddlers, and parents has become a national model and change agent for libraries wanting to serve families in a dynamic and collaborative community environment. In 1979, Feinberg created the Parent/Child Workshop, a unique program that welcomes parents and children as young as one year into the library and integrates community resource professionals within the delivery of library services. This program has gone on to be replicated nationally as part of Family Place Libraries.™ In addition to Family Place, she spearheaded the development of the Community Resource Database (CRD) of Long Island (now 2-1-1-Long Island), which includes over 10,000 health and human services on Long Island; the Suffolk Coalition for Parents and Children, a network of more than 17,000 family service professionals, and the Children's Librarians Association of Suffolk County. From 1999 to 2004, she led Middle Country Public Library through the 40,000-square-foot expansion of two facilities, which included the development of special spaces for young children and teens. Feinberg has received numerous awards— among them, the 2007 Public Library Association Charlie Robinson Award for library directors who are recognized as innovators and risk takers. Under her leadership, Middle Country received the Alfred P. Sloan Award (2005) and the first annual Godfrey Award for Services to Children and Families in Public Libraries (2002). She is the author of numerous articles and six books, is an adjunct professor at the Palmer School of Library and Information Science, Long Island University, and currently serves as chair of the Early Years Institute. Barbara Jordan served as assistant director for Grants and Special Projects and head of Parenting and Clearinghouse Services at Middle Country Public Library (Centereach, NY) during her long tenure at the library. She developed a comprehensive multimedia resource center for parents and professionals and coordinated the Community Resource Database of Long Island, an online directory of health and human services for the Long Island region. She administered the Partners for Inclusion Project at Middle Country, a project aimed at improving opportunities for the inclusion of children with disabilities in community settings. She is co-author of Audiovisual Resources for Family Programming (New York: Neal-Schuman, 1994); A Family Child Care Provider's Guide to New York's Early Intervention Program (Albany, NY: New York State Department of Health, 1996); Partners for Inclusion: Welcoming Infants and Toddlers with Disabilities and Their Families into Community Activities: A Replication Guide (Hauppauge, NY: Suffolk County Department of Health, 1997); and The Family-Centered Library Handbook (Feinberg et al., New York: Neal-Schuman, 2007). Kathleen Deerr has been working with children and families in public libraries for the past three decades. For the past 10 years she has served as the national Family Places LibrariesTM coordinator. During that time, the number of libraries in the Family Places network has tripled. Recognizing early on that children's most important role models are parents and caregivers, she has developed many innovative, interdisciplinary programs that focus on parent-child interactions and has administered programs such as the Partners for Inclusion Project, Reach Out and Read, the Parent Child Home Program, and the national Family Places Libraries™ initiative. She has served as guest lecturer at the Palmer School of Library and Information Science and is the co-author of three Neal-Schuman books: Running a Parent/Child Workshop, Including Families of Children with Special Needs, and The Family-Centered Library Handbook. A lifelong advocate for children, she has presented workshops and lectures at the state and national levels on the role of the public library in serving, supporting, and designing welcoming, early-learning spaces for young children and families, as well as lectures on the administration and management of Children's and Parents' Services in public libraries. She strongly believes that libraries are a binding thread in the fabric of their communities and play a crucial role in the development of healthy children and families. "An essential instruction guide … should be considered mandatory reading for school and community library staff members and a core curriculum supplement for Library Science students." 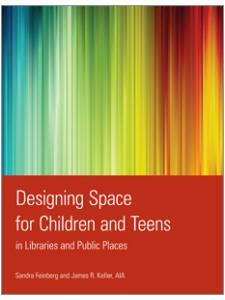 "The book reminds us of the importance for libraries to embrace inclusive practices. 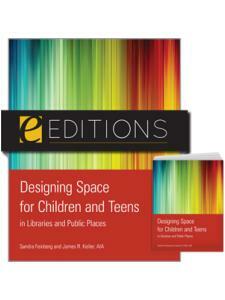 In doing so the library can be a more valuable contributor to decreasing prejudice towards children with disabilities. 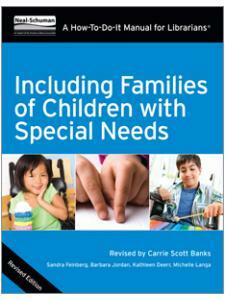 Overall the authors have created an easily read, practical and thought-provoking book for information professionals who are interacting with children with special needs."